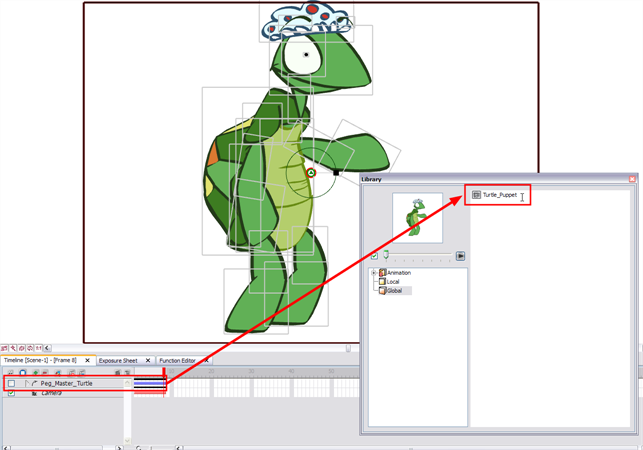 Your puppet is now ready and can be imported into your different scenes to be animated. The best way to reuse your puppet is to store it in the Library as a template. From there, you can open a different scene or project and drag it from the Library into your scene. Refer to the Importing Artwork chapter to learn more about creating templates and organizing your library. 1. In the Timeline view, click the Master Peg's collapsing arrow button to collapse your puppet. 2. In the left side of the Timeline view, select the puppet's master peg. 3. Drag your selection to the Global Library folder or any other one you may have created for your project. 4. Double-click the template and rename it with your character's name. 5. Select File > Save Global Library.